Prospect East is the first phase of a major new integrated neighbourhood in Stratford, east London, set around a central landscaped garden. This landmark development comprises a contemporary collection of apartments, duplexes, maisonettes, penthouses and townhouses, available for private sale and shared ownership. The aim was to provide ftbs with an aspirational, yet attainable design. The show home provides a realistic insight into what can be achieved on a first timer’s budget and how to make the most of a new home at Prospect East. 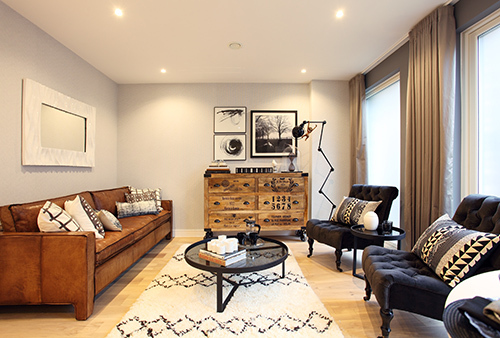 The two bedroom maisonette show home, designed by Suna Interior Design, captures the site’s former life as Stratford Works, once the largest railway works in Britain.